Life is difficult to start and to evolve to an intelligent and technologically advanced stage and we’re the only one in the galaxy. UFO’s, alien artifacts, ancient astronauts. Problem: evidence for aliens is non-existent. The aliens are here and they are keeping us in a well designed zoo (cut off from all contact) or there is an treaty preventing contact with young races. Problem: this scenario can’t be tested. Only one ET could break the embargo. The speed of light slows communications and makes space travel too long. Extraterrestrial’s messages may not have reached us yet. Problem: the galaxy exist for billions of years, even if one ET civilization formed a few million years before us, the galaxy would be already filled with Bracewell-Von Neumann probes. ET has no interest in communicating with lesser intelligences. 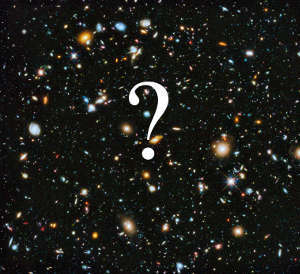 Problem: with millions of possible civilizations, some of the extraterrestrial ones would be interested in our species. The definition of a structure defines - by the excluding of incompatible functions to the structure - a reducing of possibilities of the defined structure. Our brain is such a structure whose defined functionality excludes an unknown scale of possibilities which are literally unthinkable for it. Without a possibility even to guess the loss of thinkables due to the determining structure of our brain we can only be aware of what we can think. There is the capability of existing 'life' in a structural way we will never be able to discern out of the tremendous 'sough' of unseen, unknown potentials of the given primal ground in this universe?! We don´t even KNOW what electrons make move for ages! We don´t even KNOW what gravity really IS. We are slicing the universe like a dead frog to understand what makes him live and jump. Slicing life means to find none. There is life in this universe for sure, but the chances are great that life can be so much more than we represent ourselves that we will never get it, because a toe is not an eye. We share a considerable percentage of paradigms with mammals. But we do not understand an horse or even an ape REALLY! We just draw analogies between them and us, we try to find pieces of concepts we are familiar with to get an idea of their worldview. But never ever we will reach them. So: we can´t even reach our cousins in paradigm - how, the hell, should we reach THEM out there??? My issue with this argument is that it is not really an effective comparison. NDT has made a similar comparison with chimps, and paraphrasing him here, calls out that our DNA is only 3% different and yet look at the difference in the capabilities between the species. While the difference in DNA is notably more narrow than the capabilities of each species, there is one key aspect involved that makes the comparisons invalid in the context of the supporting argument – as far as we know, ants and chimps are not sentient beings able to communicate in a sophisticated manner (certainly not in mathematics) and question the world around them. Last I checked we can, and think it is fair to assume an advanced intelligent species could recognize that in us. If we recognized even the slightest, primitive ability of ants or chimps, or any species, to demonstrate sentient thoughts and communicate them, we would have legions of scientists and researchers that would be highly interested in them. Another part of the argument I challenge is the built-in assumption that an advanced ETI would necessarily have been in contact with or able to observe other ETI’s less advanced than them, and so adding to the notion of how uninteresting us ants would be – been there, done that, nothing to see here. It is very likely, if you prescribe to some of the other Fermi Paradox hypotheses, that ETI’s are more rare than we may think and so where they do exist, are probably spread very far apart within the universe. It is very possible that even a very advanced ETI still deals with limits created by the law of physics and distances involved, or otherwise for some reason, not interested in the mass exploration or colonization beyond a galactic scale. So they could explore and colonize an entire galaxy, and end up being the only intelligent species in it having never discovered any other ETI along the way. If at some point an ETI arises in their galaxy, it would be hard to believe no matter how primitive it may be initially or over time that there would not be a great interest in that species, the first of which they had ever seen capable of sentient thought and communication. We have 1000’s of scientists studying ants and chimps today without these capabilities. Imagine how many there would be, how different today’s science would be, if they could exhibit them or we discovered a species other than us that could. My theory is that the nearest civilizations are under a non-interference accord that prevents them from making contact with covilizations that are still developing spacefaring technology. In all likelyhood they probably just enjoy watching us put the pieces together, kind of like how we enjoy watching babies and young children solve puzzles that challenge them but are easy for us. Who knows? Whatever the conditions needed for life may be, whatever the technological capabilities, there is one fundamental difference that i did not see posted anywhere in regards to the Fermi Paradox. Curiosity. Taking into account the diverse carnivorous species on earth, the ways hunting has evolved in animals, all of which we as humans had to keep our eyes on and in time our brain evolved to think in such a manner to envision potential ways that we could be attacked and killed. This is not necessary to be true on other planets. Another difference would be the basic way our brain categorizes things, fits them into categories so that they may be easily predicted and analyzed. Pattern recognition has no logical reason to be developed outside our planet and it's diverse environment. As such, even if life has evolved on other planets, it may just not be fundamentally curious, and, as such, never have evolved technological capabilities which require patterns in order for any kind of technology to work. An answer to the Fermi paradox could be that we haven`t developed the technology to receive messages from other civilizations. The idea that we will detect signals that crawl across space at the speed of light is the issue: a more advanced civilization *might* have a faster than light communication system that we have yet to dream off. Faster than light / warp type drive system seem to be a requirement for meaningful travel between stars. Of course these things are beyond our current understanding. Einstein`s rules preclude FTL- yet we can envisage possible ways around the limits - albeit requiring huge energy and technology beyond our current abilities. We thank PromoCodeLadbrokes.co.uk for their support!